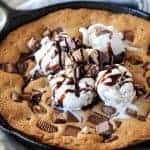 Candy Bar Skillet Cookie – A soft and gooey deep dish cookie baked in a skillet and loaded with your favorite candy bars! Serve warm with ice cream and hot fudge sauce. Happy October! I hope the weather is chilly and your hands are wrapped around a warm beverage. I am crawling out from underneath the flu, which hit me hard last week. Now that I am finally feeling like a real person again I am focusing on the important things in life … like stuffing candy bars into giant cookies! This deliciousness is an amazing remedy to the flu. It’s definitely worth crawling out of bed for! The big news today is that I finally made my first recipe video! Check it out below. I hope to bring you more videos in the weeks and months ahead. 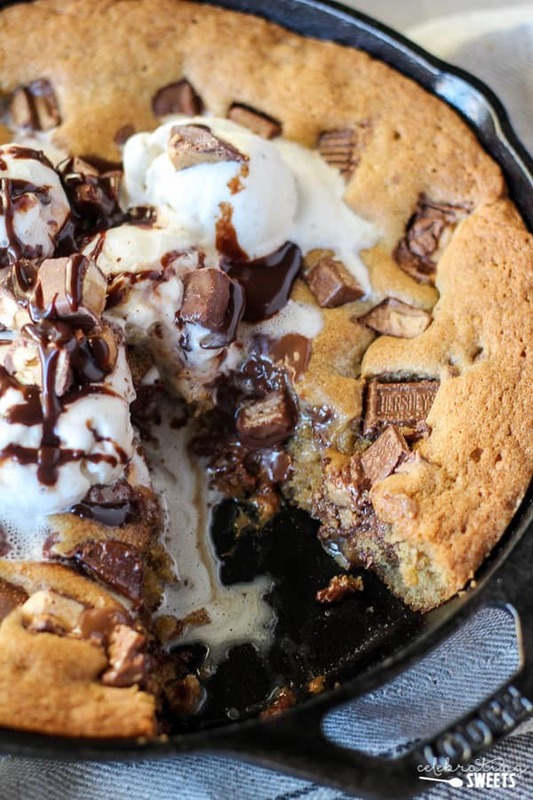 Now, onto the star of the show: Candy Bar Skillet Cookie! I made cookie dough, filled it with chopped candy bars, spread it into a skillet, topped it with even more candy bars, and then baked it until the center was soft and the edges were golden and crisp. This is quite possibly the best use of Halloween candy EVER. I stuffed this cookie with a combination of Snickers, Rolos, Reese’s pb cups, chocolate bars, and Kit Kats. Choose your favorite candy bars and throw ’em in. This would even be great with only one type of candy bar (I’m thinking peanut butter cups would be amazing). I already had several bags of Halloween candy sitting around and I needed a reason to open every single one of them, so I chose a combination of candy. I can’t imagine you could go wrong; just be sure to stick with chocolate-based candy. 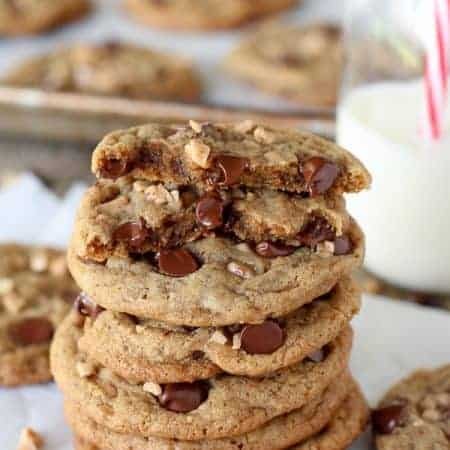 You could even swap the candy bars for chocolate chips. 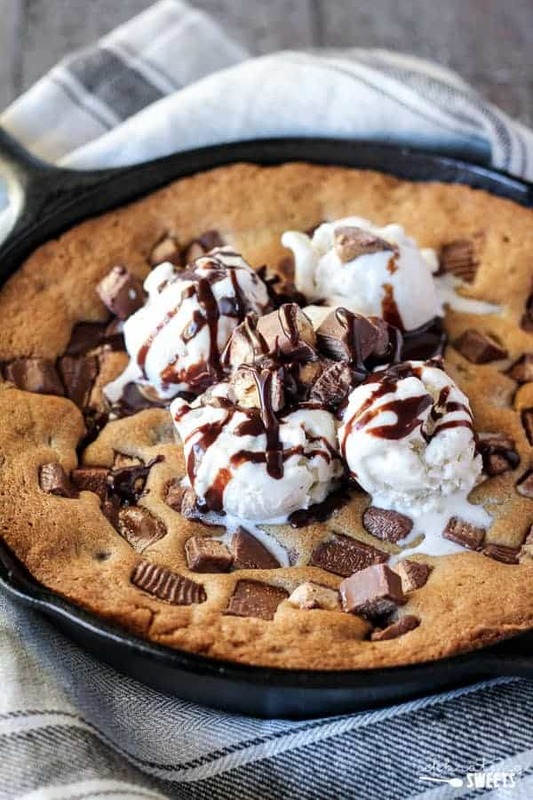 I believe a skillet cookie should be served warm when it’s extra gooey and chocolaty. It might be a little difficult to get a super clean slice (see: extra gooey and chocolaty) so scoop it instead of slice it. Or you can do like my family of savages ( ← Kidding. Sort of.) and eat it straight from the skillet with lots of vanilla ice cream and hot fudge sauce. 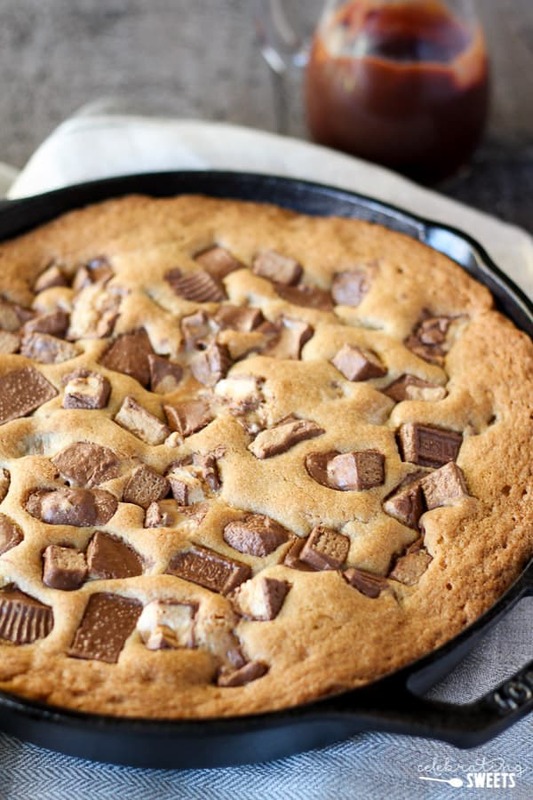 If you’re looking for a similar dessert that is a bit neater to serve to guests, this Candy Bar Cookie Pie would be perfect. Open up that candy and get baking. But first, watch my very first video! Yippee! 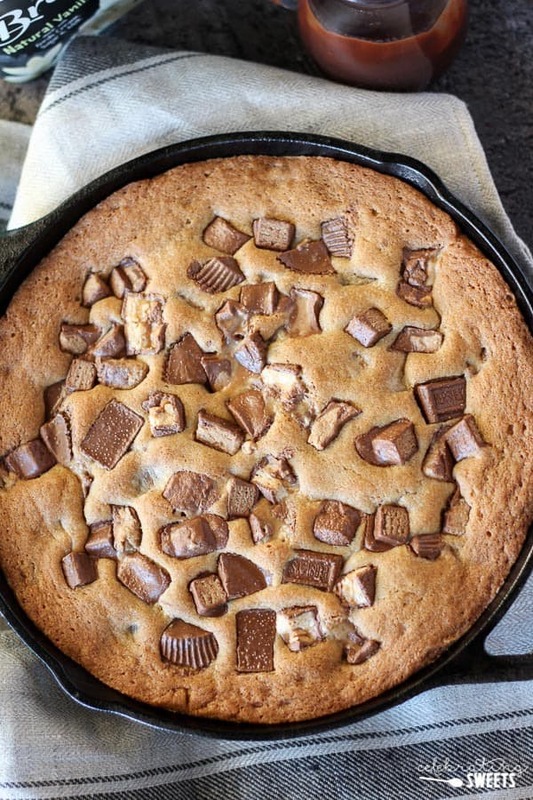 A soft and gooey deep dish cookie baked in a skillet and loaded with your favorite candy bars! Serve warm with ice cream and hot fudge sauce. Place the chopped candy bars in the freezer while you prepare the cookie dough. This will ensure that they don't fall apart when you stir them into the dough. Preheat oven to 350°F. 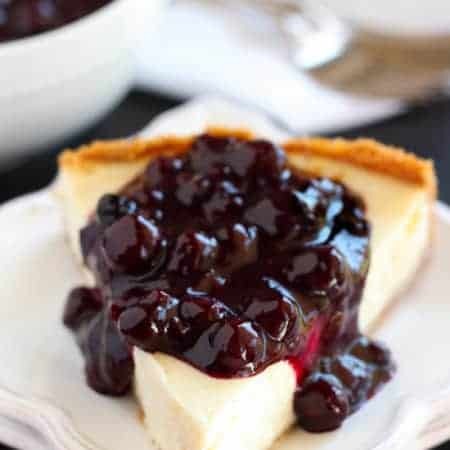 In a large bowl using a hand mixer or stand mixer, beat butter and sugars for 1-2 minutes, until light and creamy. Add eggs and vanilla extract and beat to combine, scraping the sides of the bowl as needed. In a separate bowl combine flour, baking soda, and salt. Add dry ingredients to the butter mixture and stir with a rubber spatula or wooden spoon until completely combined. Stir in half of the candy bars (from the freezer). Scoop the dough into a well greased 10-inch cast iron skillet. Spread the dough into an even layer. Sprinkle the remaining candy bars on top. Bake for 25-30 minutes, until the center is just set and no longer jiggles; the edges should be golden brown. Be careful not to overbake. Allow to cool just slightly. Serve with ice cream, fudge sauce, and additional chopped candy bars. This cookie is best served warm. Adjust cooking time based on the size of your skillet. Love the video and the skillet cookie idea! What a fun dessert!!! I need to go buy a skillet! This would be a perfect fall dessert for when friends come over. 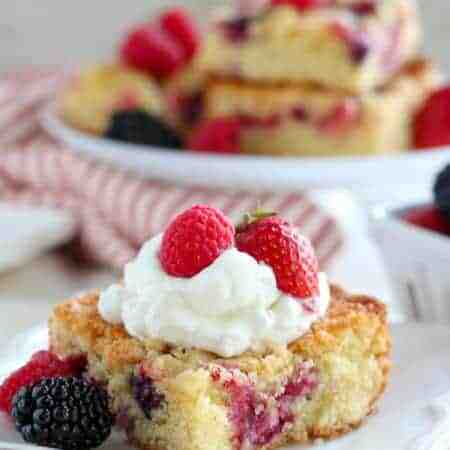 MMM looks yummy! My chocolate loving hubby would love this dessert! WHOA. This is amazing, and I am totally making this with my kids! It looks SO good! this looks too good! I love that you put candy bars in it! Oh my word. This looks so good! Oh! This is making my mouth water. This is right up my alley.